Stuttgart, October 2013. 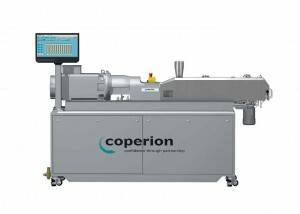 – One of the latest developments of Coperion GmbH, Stuttgart/Germany, to make its debut at K 2013 is the ZSK 26 Mc18 twin screw laboratory extruder with 26 mm screw diameter. This new extruder offers all the advantages of the ZSK Mc18 series; it has a simple design, it is operator-friendly and easy to clean. It is suitable for the development of formulations, for conducting sample compound trials and for the production of relatively small batches with up to approximately 180 kg/h. 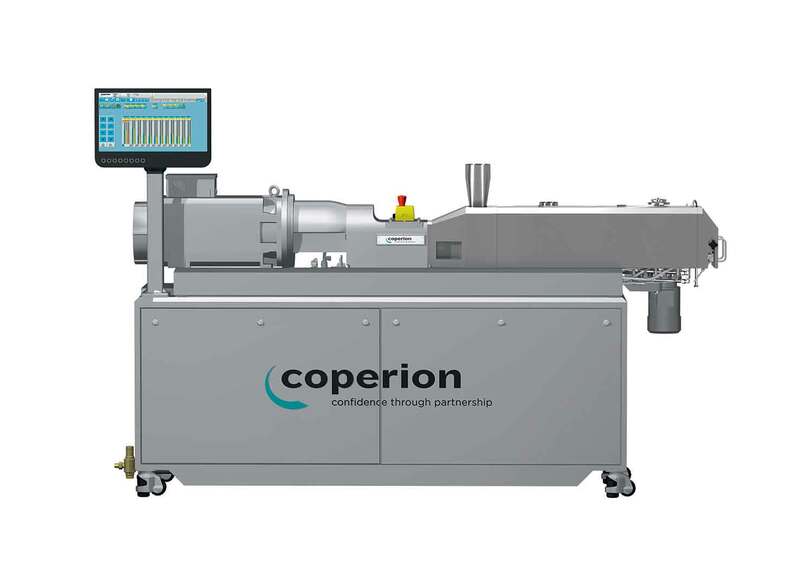 Compared to its predecessor, the ZSK 26 Mc, this newly developed laboratory extruder of the ZSK Mc18 series, which will be shown on Coperion’s booth B33 in Hall 14, is capable of an increase in throughput of up to 100%, as the specific torque has been increased to 15 Nm/cm3, and is more energy efficient thanks to the reduced specific energy input. The increased filling degree and the lower melt temperatures ensure extremely gentle compounding. The new ZSK 26 Mc18 is a mobile unit and requires only a minimum of floor space, as the control cabinet is integrated into the base frame of the machine. Heating and cooling are installed ready for use. The laboratory extruder offers additional flexibility since it can be easily converted into a ZSK 27 Mv PLUS with a much larger free volume. Configured in this way the extrusion system permits the compounding both of products with high torque requirement and of low bulk density products that require high free volume. Conversion merely entails exchanging the process section (the replacement process section is pre-assembled), which is done with the aid of an assembly trolley. All connections – screw shaft coupling, heating system, cooling system, temperature measurement – are plug-in-coupled for time-saving installation. The ZSK 26 Mc18/ZSK 27 Mv PLUS permits direct and reliable scale-up to larger machines of the ZSK Mc18 and ZSK Mv PLUS series. Following a complete redesign, the laboratory extruder is now equipped with a central water and power supply system. The cooling water manifold is installed in the totally enclosed base frame; a covered multiple socket strip supplies power to the heater cartridges. The single-piece stainless steel cover of the process section serves ideally as a dust and safety guard and – like the smooth surfaces of the base frame – is easy to clean. Because of the high specific torque, the screw shafts are manufactured from materials developed by the aerospace industry and have already proved themselves in the other sizes of the Mc18 series. The newly improved quick-release screw shaft coupling, which works on the tried and tested plug-push-principle, permits rapid exchange of the screw shafts and considerably reduces cleaning times when changing over from one colour or formulation to another. The newly designed die head features an optimized heating system and can be opened simply by loosening one single screw, for example, to replace the die plate or the breaker plate. A newly designed swivel arm permits direct machine-mounting of the ZS-B twin screw side feeder – for the feeding of fillers and additives – or the ZS-EG twin screw side devolatilization unit. The new CSpro control system is available in two versions: the basic version covers all standard applications, while the medium version offers additional functions such as order and formulation management. The laboratory extruder can also be equipped with a high-resolution torque measuring instrument, the readings of which permit a considerably more accurate calculation of specific energy input in order to enable even greater precision when scaling-up. The readings also provide information on the dynamic behaviour of the two screw shafts and make optimized configuration of the screws possible.